Yeti 3.0 is a major release with many new exciting features, updates and bugfixes - although Maya scenes created with previous versions can be loaded we can’t guarantee the exact look of grooms will be maintained. We strongly suggest re-caching any assets with the new release. A new Braids geometry type has been added which provides a simple but robust means of create braid like hair styles. 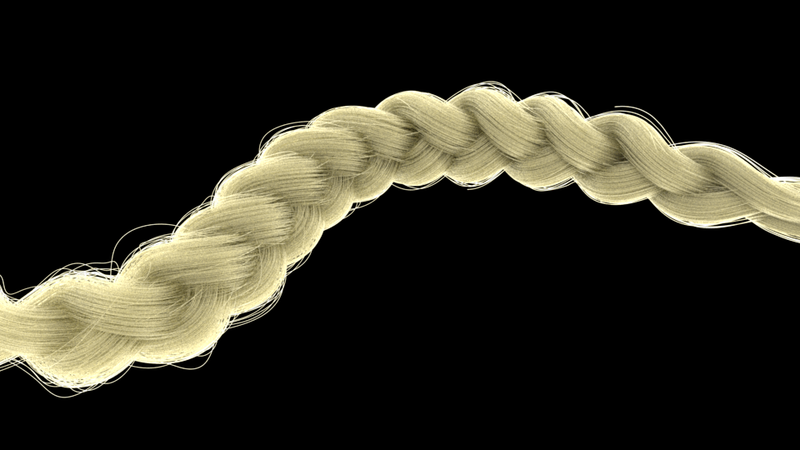 Like feathers a Braid is made up of a Maya node, which is attached to an input curve, used for visually creating the look of the Braid which can then be imported into a Yeti graph for further tweaks. As a new feature we are extremely keen to receive feedback from our users as to how we can improve the Braid workflow in the future. Deformation Layers have been added to the Groom nodes which allows layering up of Guides and Grooms on top of a hero Groom, it’s a concept similar to Photoshop layers but for strands. Each layer can be re-ordered and their weights adjusted on a per layer basis allowing a new level of control over complex Grooms. The Grooming UI has been improved with the brush based tools moved into their own Tool window providing a much more unified interface. the Paint Value’s float slider has been replaced with a color slider which also supports values above 1.0.
the Lift brush has been updated with a more predictable behaviour with varying base and tip strengths. curves can be added to a groom using the Add Selected Curves to Groom menu item, or the new addSelectedCurvesToGroom parameter for pgYetiCommand. 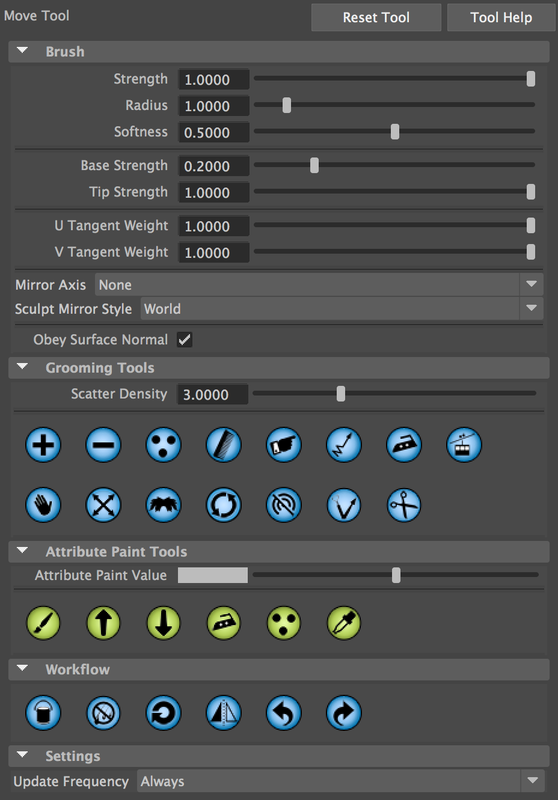 there is now the option of World space or Screen space mirroring for the Sculpt brush. varying division counts for Feather primitive. added a feather profile curve attribute to Feather primitive. additional feather attributes have been turned into ramps to control their values along the length of the feather. 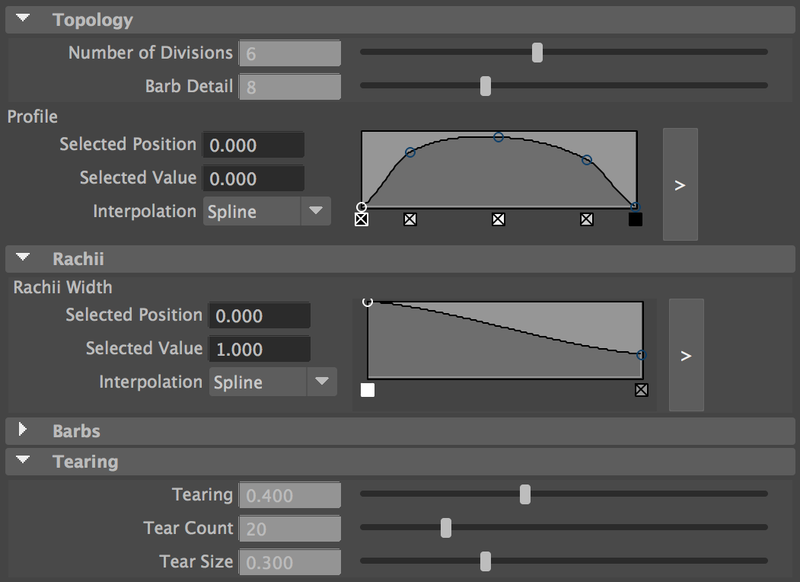 added a Barb Detail attribute to control the number of vertices used to define the barbs. a correct PRef for feather geometry has be implemented. Although feathers created with previous versions can be read there will likely need to be tweaks made to match the original appearance. 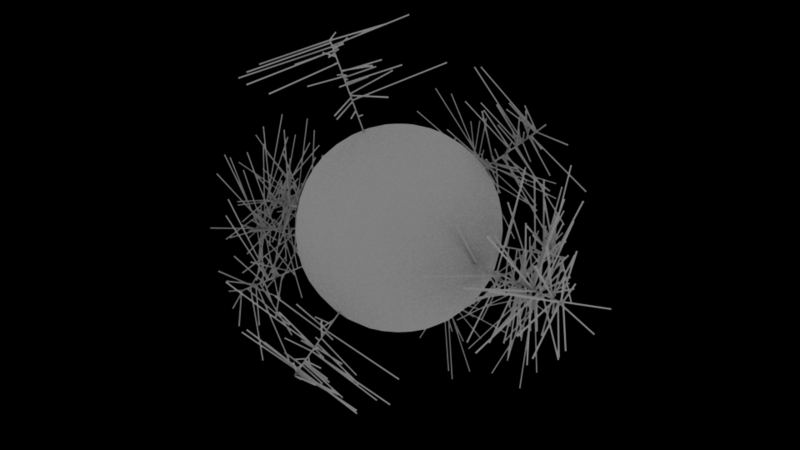 It is now possible to Scatter points onto Fibres which allows much more control over placing debris, snow, and other instances and the ability to recursively generate fibres. The below graph and image shows how new fibres can be grown off generated fibres - not just limited to fibres, once the new points are scattered instances, feathers, etc. can be used (you can even Scatter new point on top of meshes instanced to these points). Additionally, Braids and Feathers can now be converted to Fibres within the graph using the Convert node, which means that points can be scattered on those geometry types too. an Auto-Layout option which can be found in the Utilities menu. the ability to search all of the nodes in the Graph Editor, use CTRL-F to bring up the UI. full support for Undo and Redo within the both the graph editor and node inspector. After a few releases we finally merged our refactored Viewport 2.0 shaders in which provides the ability to preview color attributes within the viewport. 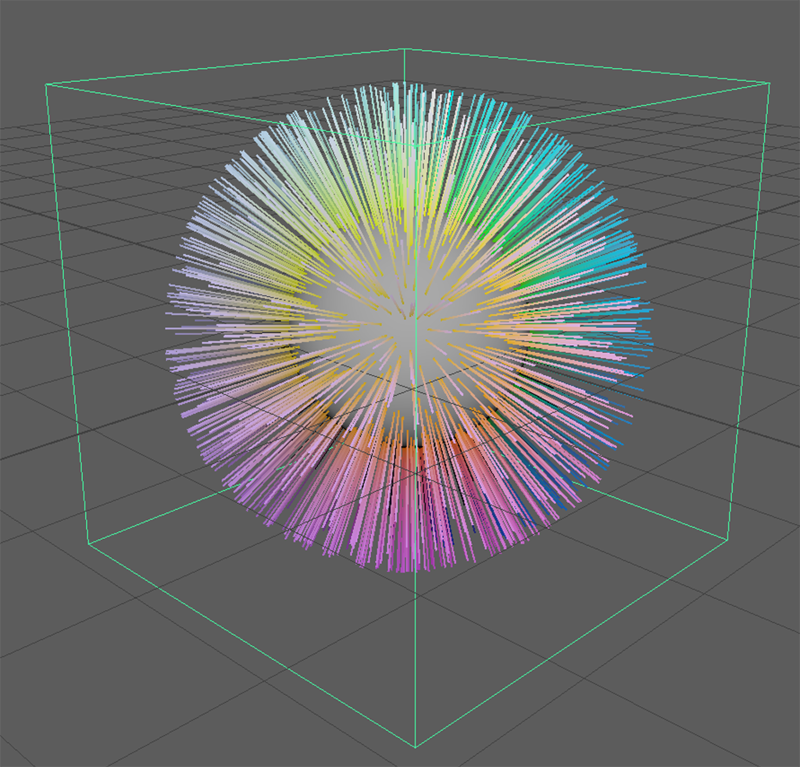 Right now only diffuseColor is supported (via the Attribute node or using the Shader node) but in the future we plan on expanding this visualization capability even further. added -currentHash parameter to pgYetiCommand which will return the current hash of the selected nodes graph. added -hashAt <time> to pgYetiCacheInfo which will evaluate the hash of the cache at the specified time. refactored how object id’s are handled and stored, due to this we recommend re-caching for this release. re-introduced the YETI_INTERACTIVE_LICENSE environment variable that, when set to 0, will avoid any interactive licenses being checked out. refactored Input Object List so it updates without having to re-open the Node Inpsector. updated Width node to ensure the resolved Tip Parameter value was never less than the Base Parameter value. Clarisse warning logger is now used when Yeti is unable to obtain a license (vs. just the Console). refactored how varying knot styles are handled internally. Instance node defaults to Elements vs Points. integrated OpenSubdiv 3.3 for more stable and optimized subdivision support. added -connect and -disconnect commands to pgYetiGraphCommand allowing nodes to be wired up via scripting. static lengths are now computed for strands to ensure consitent segment lengths across temporal samples which makes By Length in the Grow node more stable. refactored the relaxing code in the Scatter node which provides a huge speed increase with much better results. added the option of providing an alternative UV set name on input mesh objects via Yeti UV Set Name attribute. fixed issues relating to strands being stuck when using the Move grooming tool. strand segments are correctly drawn when isolate selected has been toggled in a grooms display options. updating Arnold subdivision parameters will now cause the graph to re-evaluate in the viewport. texture coordinates (and other face varying attributes) are now correctly interpolated when using subdivision surfaces. integrated a refactored Scatter node which resolves many issues with holes being introduced in the resulting point cloud (especially with Subdivision Surfaces). refactored brush dynamics for Sculpt brush which avoids issues when a brush softness of 0 is used. Point position and strand shape is correctly restored when using Undo when editing in component mode. corrected root parameter evaluation for strand interpolation which was causing strands to lift off the surface with topology changes. more intuitive response by the Scale brush to positive and negative brush strength values. resolved crashing when using the Smooth brush.